The PowerConnect 5448 delivers significant price/performance benefits to customers. In addition to offering a secure, high-performance networking platform and delivering advanced network management features, the PowerConnect 5448 is the world’s first switch which self-optimizes for iSCSI storage traffic. 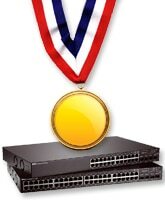 These features allow network administrators to effectively optimize and secure their network traffic. The PowerConnect 5448 delivers 48 ports of wire-speed, Gigabit Ethernet with advanced security and enterprise management features to meet the needs of organizations of all sizes. Providing 96 Gbps for switching capacity and 71.2 Mbps forwarding rate, the PowerConnect provides ample performance for server aggregation, wiring closets and iSCSI storage. 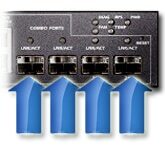 Combo ports (4 ports of either SFP Fiber support or 10/100/1000 Copper support) provide for connectivity flexibility and long-haul connections. The PowerConnect 5400-series is the world’s first switch portfolio to automatically optimize itself for iSCSI storage. 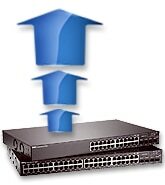 The switches automatically detect whether traffic flows are iSCSI-based and if so assigns that traffic flow a high-level of quality of service. This helps ensure that iSCSI storage traffic is prioritized in the event of resource contention. The 5400-series also provides information about all active iSCSI sessions to allow for easier management and optimization. 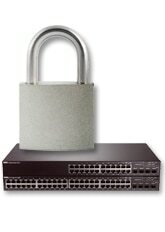 The PowerConnect 5448 offers multiple options and levels of security. Industry-standard features include SSH/SSL Management Encryptions, DHCP Snooping, IP and MAC Based ACLs access password protection and Port-based MAC Address alert and lock-down. Higher level security is provided through RADIUS remote authentication for switch management access, 802.1x Authentication and TACACS+, Management access filtering via Management Access Profiles. Supports open industry standards including quality of service (L3-aware), multicast support, link aggregation, and dynamic VLAN configurations. Voice-VLAN functionality helps ensure VoIP traffic is prioritized in the event of resource contention. LLDP-Med provides detailed network topology information, emergency call service via IP Phone location information, and troubleshooting information. 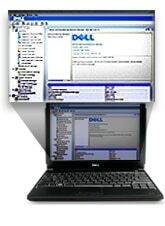 PowerConnect provides numerous management options including an industry-standard CLI, remote management using an embedded web server or support for SNMP-based management applications.